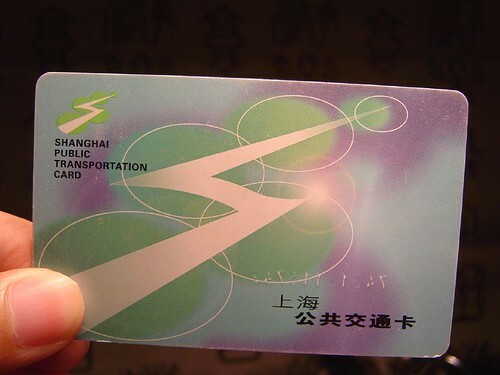 Public Transportation Card has become an essential part of people’s life in Shanghai. The Public Transportation Card is a credit-card-size plastic card with IC embedded in it. The card has mat surface, and is a little bit thicker than credit card. The surface is smooth, and don’t have big numbers printed on it. The card basically satisfies one’s all transportation needs. It can be used on all metro, almost all buses, major taxi, and ferry. The usage is now extended to highway fees, car services fees, and can be used to pay electricity, gas, and water. It can also be used by limited operators in other cities. Look at this table. Among all the usage, metro and bus are major reason people need it. If you look at the long line waiting at the ticketing window, you will be happy to have a card on hand. Where to Buy the Card? You can buy the card at the ticket office of all metro stations. Some convenient stores also vend er the card. They charge 30 RMB for the card. That means, if you pay 100 RMB, you get a card with 70 RMB available fund in it. You can get the 30 RMB refunded if you return the card back to the card company. Maximum deposit in the card is 1000 RMB. Passengers can query the last 10 times of usage of the card. The machine I like is at the Metro Line #1 People’s Square Station. Swipe the card on the machine, and you can see when (at which hour and minute), and where you used the card, and how much they deducted from the card. People put the card in different places. For example, I always put it in my wallet, and every morning, I swipe my wallet at the card reader. It is sensitive enough to sensor the card and deduct money from it. Some people put it in bags. So they swipe their bags again and again on the sensor until it beeps. Some put it into pocket of jacket, and swipe the pocket. Some even put it in the pocket of treasures, and jump to have card sensed. If you stay at the gate long enough, you will see different performance of card holders. It is kind of interesting. If you stay here, do get one. If you are just a visit, maybe to buy a card and bring it back home is a good idea. It is a reliable evidence that someone has ever stayed in Shanghai and took the Metro (you cannot bring Metro Ticket back home, since it is recycled). JS, excellent idea, can I buy it at the PVG airport upon arrival? stephen, you cannot. You can take Maglev to the Metro Long Yang Station and get one there, then you can ride the Metro with your new card. Important other fact about the card is that it offers no discounts in any form, though. It is just more convinient to use it than buying a ticket each time. According to your photos, this card some how looks like the LRT card in KL, Malaysia. But for me myself, I prefer the Singapore Ez-link card, which is more “artily” designed…and more widely appied. matsch, the card does offer a discount. When prices were raised on the metro last year, the city reacted to criticism from citizens by implementing a “10% off further tickets after spending RMB 70” discount on metro tickets bought using the card, a discount which resets on the first day of every month. JS, thanks, I can’t take my baggages into Metro and walk out from the concourse at Xujiahue, I’ll get my card at 24Hr stores after arrival. is there a time limit on it? I really wanna buy one though living outside of Shanghai. where is “The machine u like at the Metro Line #1 People’s Square” actually? Yestoday, I read some information about your blog on the Xin Ming Evening Newspaper, I’m interested in it. So, today, I want to visit your blog! Everyone in my home has Public Transportation Card ,we all think it is convenient! After you’ve been using your card for a month or so, I think you do start getting a 10% discount. this blog is great and fantastic,I’m a senior high school student,I read yesterday’s evening news paper and knew your blog,in my opinion,the blog can improve my English ability and skills too. How can I talk with the foreigners who always post the comments? This is my first time to visit here, when I got the news from Xinmin Evening Paper. Jianshuo, you really did good job, and I’ll introduce it to my friends. I am a reporter in Shanghai. I happened to read your blog when I did a review of SARS for an American newspaper last year. Your blog gave me a lot of inspirations. Would you please write me back when it’s convenient for you? I am David in SJTU.Have you received my invitation letter to Mr Jiang? I hope he can reply me soon.Thanks. David, I got the letter, but I have forwarded the letter about half year ago, and it didn’t work, so I don’t forward this time. China’s Public Transportation Card stole this concept from Singapore’s Mass Rapid Transport who innovated the Ez-Link card in 1990. The earlier version of Ez-Link card, a flimsy magnetic card called MRT card was used between 1984 to 1990 until Ez-Link came along. 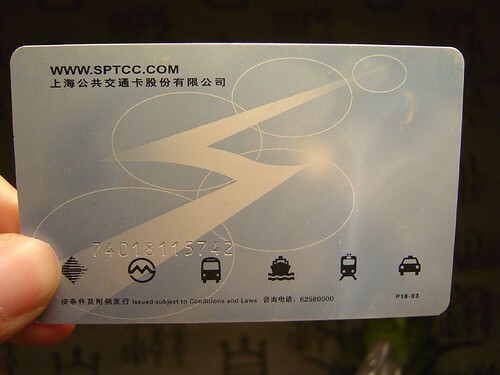 I am teaching a class in Shanghai and want to show my students a picture of what a metro card looks like. Thanks in advance. What is the “pocket of treasures?” At a guess, I might say the front pocket of a person’s trousers, but am not at all familiar with this phrase. There is an interesting article titled “Chinese Tech Buffs Slake Thirst for U.S. TV Shows” in the New York Times today. It talks about how many Chinese groups are making American popular culture available in near-real time free to Chinese audiences, dodging Chinese censors and American copyright lawyers. What are your thoughts about the general Chinese populous watching American TV shows? Elsa, yes. It shoud be the pocket of trousers. Didn’t use the word for a long time. Elaine, SPTCC did not steal the concept from Ez-link, the original patent owner of this card is Smart Card developed in ’70. The largest franchisee of Smart Card to-day is Octopus in Hong Kong. Both SPTCC and Ez-link are now the franchisees of the patent owner. Actually, there is a discount when you use the card at the metro. After you have used it for more than 70 RMB in a month (metro only, not bus or taxi), subsequent trips are discounted by 10%. Hi , jianshou. I am a student from Jiangxi university of finacical &economical. I major in marketing .I will graduate next year. I eager to find a job in shanghai after i graduate form university .i get much useful information form the report that introuduce your boggler on xinming evening newspaper.I live in nanchang city,there are also foreign friends. I think you did a great thing. I want to service foreign friends who are in nanchang city. so I want to improve my English by chatting with foreign friends.could you tell me how to do?This summer holiday i do a part-time job in a glasses store .I found most of friend in nanchang need help. they cann’t speak chinese at all. I am looking forward to your reply! I will preciate if you give me a hand! What you wrote down I think is really beneficial to the foreigners visiting or working in Shanghai. And the part dwelling on the holder’s performence is that interesting. The transportation card is extremely useful for tourists like me. No need to spend extra time at the ticketing counter, or fumble for coins for single trip ticket purchase. One thing to note, purchase the card earlier in the day. I have tried at Middle Henan and Lujiazui metro, all said that the card is out of stock. I remember the time was just after lunch, on a Friday. I was rather surprised, because I do not come across this situation in Singapore. A check with one of the Kedi store revealed that topup is not available later in the day due to a ‘quota system’ at the bank, thus it is suggested to purchase and topup the card the earliest you can. I always do it early in the morning, before going for sightseeing. Is it possible to hold 1 card when travel with 2 boys, 13 and 10? I bring you greetings from the office of LIGHT COMMUNICATION LIMITED one of the leading Advertising,Marketing and Public Relations Company in Nigeria. We will be happy if you can assist on getting it. My card was damaged on March 22 2007,I brought it to fix at Wei Ning station,received by Mr.Zhen,I was asked him can he please check the amount in the card ?he said no,then I asked him if the amount will be the same after fixing ?he said he dont know.coz on 16 of March,I refill my card for rmb 900,and you know what,when I pick it up today it left over only rmb 21,where my money goes ?nobody know,when check online they rejected my card number. How can I get confident to such system ? I use the card all the time. Wonderful! The blog says the following about the metro card: “It can also be used by limited operators in other cities” and says to see the table. The table is in Chinese. Where can it be used? Where can I return my spare Shanghai Public Transportation Card to the company concerned. it is called the “jiāo tōng kǎ” （交通卡）, in case you need to ask to buy or use one. I try find web address:xinming evening newspaper(international). I would like to share my bad experience when I was using my card. I got on a taxi with a friend. As we used English throughout, I guess that gave myself away for the opportunistic driver to swap my fully charged transport card (over 900 RMB on the card) with his own (prepared earlier, with zero credit on). What made me angry was, not only he swapped my card, he also claimed the card was not working and demanded cash payment. Since I remembered using “my” card shortly before, I did not suspect otherwise but to blame the reliability of the card. At the transports card service center, I was told this is the usual trick unlicensed taxi drivers pull on foreigners. From then on, I insisted on not to hand over my card but to first to get off from the back seat to the front with my card wallet all the way in my hand. I enjoy reading your blogs and information about Shanghai. They are very informative. Keep up the great work. I still have my transport card from 4 years back (from 2006), will I still be able to top up and use today? Or has the transportation card change since then. I enjoy reading your blogs and information about Shanghai. They are very informative. Keep up the great work.its brilliant work.